Guarding the Christmas Turkeys. Not easy to count either! I was posted one November, to a farm near Kinoulton in Nottinghamshire, assigned to protect the Turkeys being fattened in time for Christmas. As usual the assignment instructions were vague and lacking in detail. when I arrived, it turned out I was required to drive between two location throughout the night, and try to count the Turkeys to ascertain if any had been stolen, and secure the premises and report it if they had. One site was on the farm, and had 50 birds, the other site was at an old graveyard the farmer had bought, and was using temporarily as a hold for the birds, this held 38 birds. I was given a Land Rover to do the patrols in, and offered the use of a kitchen to get refreshments, and do my ablutions. 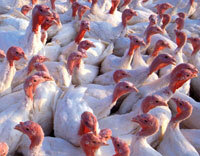 Counting turkeys is not easy. I found the best way was to creep silently as possible up on them, and count them from a distance. Once they were disturbed, it was all but impossible to count them.. and the noise! On about my third visit to the graveyard site, I could count only 29 birds, so I radioed in with the details, and parked under a tree to observe the site for a while in case anyone was still on it, or might return for more birds. I counted them again after about half an hour - and found there were now 32 birds! Confused, I was determined to sort out this anomaly, and again counted them, 32 this time! I entered the gate, and disturbed the noisy birds, in an effort to assess just how many there were. As I was doing this, the owner arrived and we did a count together - there were 29 again this time! He joined me in the Land Rover to observe the site. He offered me a drink of Jameson's Irish Whiskey from his quarter bottle. Tempted as I was, I had to refuse. He told me that he too had found different counts on the same day. We entered the fenced of graveyard once again to count them, and that was when I saw the mausoleum top, and broken down door in it! The Turkey's had been going down into the vault, making the count vary! The farmer was well pleased, and we drove back to the farmhouse, and he fed me with bacon, eggs, and home baked bread, with a string cup of tea! Thanked me again for sorting it out, and was very happy. I got a bollocking from the night manager, who thought I should have said nothing, as the company had now lost the job! Chapter 68 - The Irishman, the Scotsman. and the Englishman, and the Moonlight Dip! I'd been working nights as usual, guarding the old Victoria hotel that was being refurbished, along with my colleague 'Mad' Mick, for about a month. We had suffered with the antics of drinkers coming out of the nightclubs in the early hours, and the client had added an extra guard. Control sent us Andrew, thus making up The Irishman, Mick, the Scotsman Andrew, and the Englishman, me. The assignment instructions required one officer out of the security cabin at all times, and inside patrolling the building. This particular night, it was my turn to be based in the porta-cabin with the RT, and patrol the front of the the site. Mick had gone into the building on patrol, and we had agreed he was to return to the cabin at 1100hrs, to swap with Andrew. By 1115hrs, with no response to my calls to him on the RT, I informed control, and Andrew went inside to check on Mick's status. Now I was in a dilemma! If I left the frontage to go in and search, I'd leave all the equipment and tolls at risk, if I called the police, control would not be happy... As I pondered my response, Andrew turned up, telling me that Mick was in the swimming pool in the basement, having a whale of a time. So I thought, (bravely) it was my duty as site supervisor, to fetch him out and bollock him. I told Andrew to stay at the front and keep his RT on, and I wended my way down through the maze of narrow stairs to the pool, I found a broadly smiling Mick getting back into his uniform after his moonlight swim. I stood staring straight ahead at his belt buckle (He was a big lad) and pretended to tell him off. The RT burst into life. It was Andrew, informing us that the Night Manager had just turned up! At that precise time, a loud crack was heard from the cellar at the back near where the train lines ran. I informed Andrew on the RT that we were going to take a look. Andrew and I went to investigate, we saw steam as we approached the door to that cellar, tested the door for heat, then gingerly opened the door... to be confronted by three balaclava wearing burglars who had just broken through into the cellar, bursting some hot water pipes en route. Whether we were more surprised or they were, I cannot say. Mick was struggling with one of the men as I got a clout on the head with a crow-bar I think it was, then thank heavens Andrew and the Night Manager arrived on the scene, quickly followed by the police with a dog. One of the very few times we were actually able to assist in the capture of any criminals. I hate to think what the outcome might have been if Mick hadn't taken his moonlight dip! * Misplaced left hearing aid. (fell out when I fell asleep, 15 minutes searching. * Fell asleep, burnt saucepan and beans and sausages. * Hobbled down to shops, collected food, and realised I'd got no money or card with me. * Free from Senior Moments! * Burnt finger taking out the baked potatoes from the oven - which I left on with tray in it - smoke and smell alerted me to this two hours later. * Broke spectacle arm when I fell asleep, and squashed them as they slid down the side of the chair. * Burnt pan of macaroni cheese - pan destroyed. * I wished my neighbour a Happy Birthday instead of a Happy New Year. * Put bleach in bathwater by mistake. * Got caught talking to the pigeons as I fed them. * Tried to change battery in the mobile - I'll ask my neighbour if he can do anything with the pieces.